Another one to tick of the ‘Special Cakes’. I knew from the start that this was going to be a long afternoon of baking, as this recipe takes up 3 pages in the book and, much to my disappointment, didn’t include a photo of the final cake. Hopefully from the instructions I’d be able to work out exactly how it looked! Reading through the recipe it looked as though it was a pastry bottom with a choux pastry ring on top and profiteroles on top of that, filled with vanilla custard! This cake is a Parisian speciality and was named in honour of Saint Honoré the patron saint of bakers. The first thing I had to do was to make the páte sucrée. I’ll admit I cheated and made it in the food processor, but if you’re making it by hand then measure 100g plain flour into a bowl and to this add 50g softened butter. Rub the butter in to the flour until it resembles fine breadcrumbs and then stir in 50g caster sugar. Finally add 2 No egg yolks and mix until the ingredients just form a dough. Knead the mixture gently until it is smooth and then wrap it in cling film and leave to rest in the fridge for at least 30 minutes. Whilst the pastry was resting in the fridge, I had another read through the recipe and decided to make the crème pâtissière (vanilla egg custard). Into a small pan I measured out 600ml milk and added to this a vanilla pod (which had been split down the centre). This was heated to just below boiling point and removed from the heat. The milk was left to infuse for about 10 minutes after which it was strained and the vanilla pod discarded. In a bowl I put 4 eggs, 100g caster sugar and 50g plain flour. This was mixed together with a little of the strained milk. The remaining milk was then poured over the egg mixture, stirred and then returned to the pan and cooked over a gentle heat, stirring continuously until thickened. The custard seemed to take forever to thicken, but it’s not something to be rushed, so I patiently stirred and stirred and stirred. Eventually the mixture thickened. The custard was poured into a clean bowl and covered tightly with clingfilm to prevent a skin forming. The custard was left to cool – but remember to stir it occasionally! By now 30 minutes had gone by so it was time to return to the páte sucrée . The oven was put on to preheat at Fan170°C. The páte sucrée had to be rolled out on a lightly floured board to an 18cm (7″) round. The easiest way I found was to roll the pastry out and then gently place on the top the removable bottom from my 18cm cake tin. Using a sharp knife I cut around the edge of the pastry. This was placed onto a greased baking tray and the edges crimped and the pastry pricked all over with a fork. Into the oven it went for around 20 minutes, after which time it was a pale golden brown. 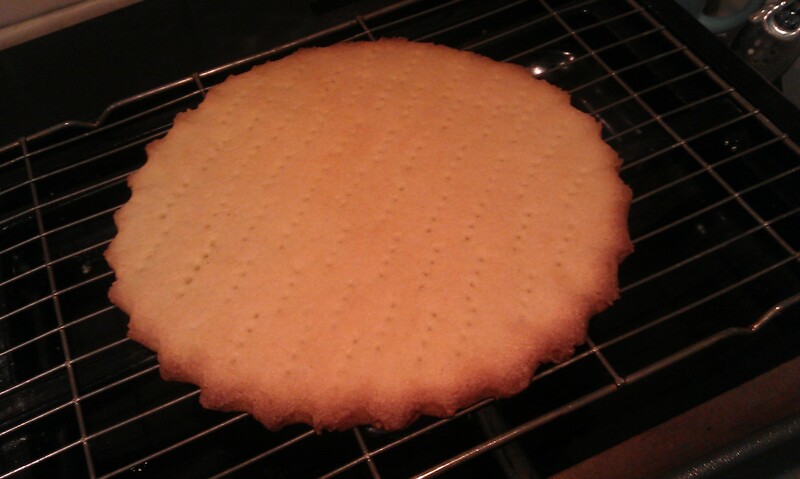 It looked very much like shortbread! It was left on the baking tray for a couple of minutes and then removed onto a wire rack to finish cooling. The oven temperature was increased now to Fan 200°C. 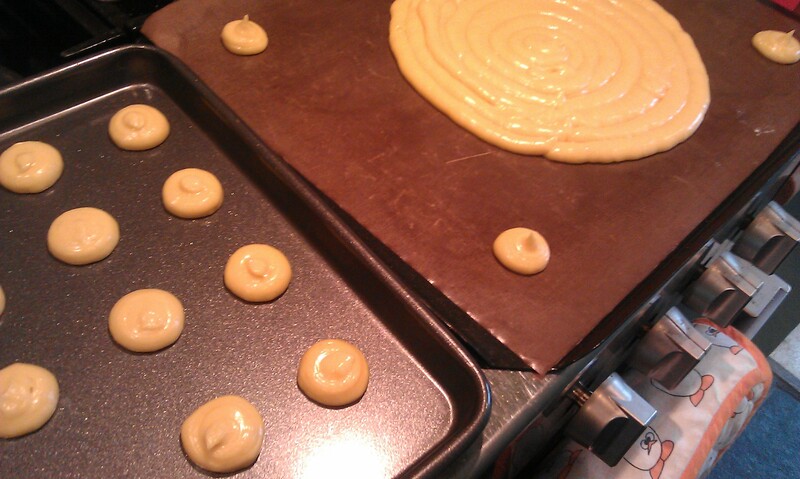 The next step was to make the choux pastry. I weighed out 50g butter and 150ml water and put them into a medium pan, which was heated gently until the butter had melted and then brought slowly to the boil. The pan was removed from the heat and 65g plain flour was tipped in. This was beaten together until it formed a smooth ball. I was surprised reading through the recipe that the mixture wasn’t to be put back on the heat for a minute, as I have always done this whenever I’ve made choux pastry before. However, Mary doesn’t mention this, instead it was left to cool for a while after which 2 large eggs were beaten slowly into it, making sure the mixture was beaten well between each addition. This left me with a lovely shiny paste. 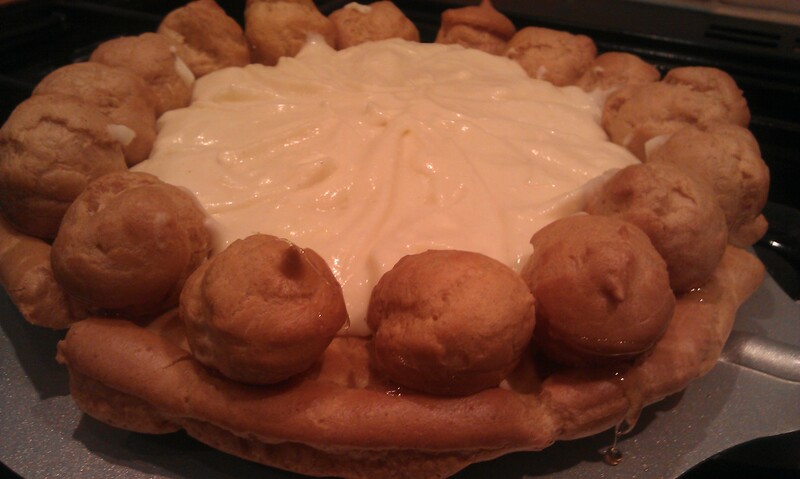 The choux pastry was spooned into a piping bag which should have been fitted with a 1cm plain nozzle. I either had a nozzle which was about 0.75cm in diameter or one which was about 1.5cm. I decided to go for the smaller one, but I think I probably should have used the larger one! The choux pastry was piped out onto a lined baking tray into an 18cm (7″) ring, with the remaining choux pastry being piped into pieces about the size of a walnut. These were put into the oven for 10 minutes, after which time the temperature was reduced to Fan 170°C. The pastry was left in the oven for another 20 minutes after which time it should be well risen, golden brown and crisp. The little pieces had risen lovely, but my choux pastry ring looked a bit of a disaster, it hadn’t risen half as much as I expected it to have risen. The pastry was removed from the oven and small holes put into the base of the little pieces and the ring. These were popped back into the oven for another 5 minutes in order to dry the centres out, after which time they were left to cool on a wire rack. It was now time to finish off the crème pâtissière. Into yet another bowl I measured out 150ml double cream which was whipped until it formed soft peaks. The crème pâtissière was by now cool, so it was whisked until smooth and the cream folded in to it. Again this had to be covered with cling film and refrigerated until required. We’re nearly there, honest. I must admit by now I was getting a little tired of everything – mainly because I could see the huge pile of washing up that had been accumulating whilst making all the separate parts of this dish. Once the crème pâtissière had cooled it was put into a piping bag and piped into the underside of the choux pastry ring and also into the small pieces (which resembled profiteroles). These were put to one side whilst I made the next stage – some caramel. In a small heavy based pan went 225g granulated sugar and 75ml water. This was heated gently until the sugar had dissolved, after which it was brough to the boil. The syrup was boiled until it turned a golden colour. At this point the base of the pan was put into a bowl of cold water to prevent the caramel from darkening any further. The pan was then immediately placed in a bowl of boiling water to keep the caramel liquid. Finally, it was time to put the dish together. The páte sucrée was placed on a plate and on top of this went the choux ring. I was a little disappointed at this stage as I was rather pleased with my páte sucrée, it was probably one of the best looking parts of the dish and I’d just completely covered it with the choux pastry. The next stage was to dip each of the bottom of the small choux buns into the caramel and then place them in a ring around the outside edge. You had to hold the buns in place for a few seconds until the caramel had set. By the time I had finished my caramel appeared a little thick and I was unable to spoon any over the top of the buns which Mary says to do. I did think of making some more, but if I’m honest as I said above, I was beginning to lose interest in this cake! The remaining crème pâtissière was spooned into the middle of the choux case. I say remaining, but I actually had rather a lot left over. If I make this recipe again I think I’d half the amount of crème pâtissière I made as I think it made far too much. The remaining crème pâtissière actually got made into a banana custard the next day and it was surprisingly good! The final decoration should have been some spun sugar on the top of the cake. I did manage to make a small amount of spun sugar, but I made the mistake of putting it on the tray that I had left the remaining choux buns on, which I had told everybody to help themselves to. When I went to put the spun sugar on top of the cake so that I could take a photo, I found that it had been eaten, so although I made it, I have no photo at all of it! Looking at this cake I was rather disappointed, it didn’t really look very stunning after all the time and effort that had gone into it. I decided to ‘google’ the name of the cake to see what it should look like and I was quite pleased to see that most of the photos online did actually look similar to the cake I had made, so perhaps the choux pastry shouldn’t be that huge! Will I make it again – no I don’t think so, although it did taste very good and it was soon eaten up by the family!